Slik Monopods. Are They A Good Fit That Will Work For You? Slik monopods. Are they the right design for you? Designed for professional photographers, but many amateurs and hobbyists who don't mind the investment, have been known to buy a monopod made by Slik too. They are described by Slik as ultra heavy construction and they work great with video, D-SLR, still cameras with large lenses and "medium" and "large" format cameras. As of October or 2011, Slik had 11 different models of monopods on their website. SLIK started manufacturing high quality tripods over 50 years ago. Slik uses the tag line "The most copied line of tripods today" on its web site and it may be a true statement. Slik Monopods are moderately priced pieces of equipment and rate well in online monopod reviews by customers. 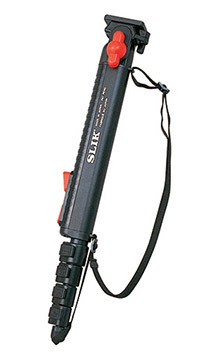 The most popular monopod by Slik is the Slik EZ Pod Monopod with Pan Head and Quick-Release. It is right in the middle of their price range of monopods coming in at around $60. The two best features on this piece of photography equipment are the height adjustment system and the camera quick release. Its top section is large and has a unique shape; originally made for video cameras, it is very popular for still cameras as well. The height adjustment is an easy, one-handed push-button with an anti-gravity feature. The quick release plate lets you mount or remove your camera quickly. The extra thick hand grip is a pleasure to use. Another feature is the included shoulder strap which is so much better than those annoying hand straps. Maximum height is almost 62 inches (1,570mm) It has 5 legs sections so it compacts down to just over 18 inches (470mm). The Easi-pod weighs just under 24 oz. (660 grams). The only two drawbacks: If you are taller than 5' 10", you may not find it tall enough to allow you to shoot without bending over slightly. Secondly, there are plastic parts that are more susceptible to breakage than the monopods with all metal or carbon fiber parts. One tip on how to use a monopod is to brace the monopod against a seat if your sitting or against your foot if you are standing to get added stability. Links to more photography tips regarding monopods are below. The SLIK EASI-POD has been the choice of videographers for many years and used to capture family events and memories. This is a 5-section monopod that comes with the SBH-100 ball head. The ball head has a simple one lever release. The 5 sections give you a maximum height of over 63 inches. It's sturdy enough to handle a DSLR and standard zoom lens. This is the ultimate travel monopod for backpackers who want to travel as light as possible. It's about 40% lighter than its aluminum counterpart and weighs in at less than 1 pound. "Speed Release Locks" are a new proprietary feature of these lightweight Slik monopods. They are spring loaded for fast setup and break down and do not snap back and pinch your fingers. It also is rated to handle almost twice the weight of the Lighty Pod III. Opteka Monopod Reviews. Opteka monopods are a more recent entry into the photography equipment scene are therefore have modern features. Manfrotto-Bogen Monopods - Reviews. Another monopod brand to consider, usually purchased by professionals, but also great for anyone who want the best quality and features. Gitzo Monopods. Gitzo is the name for monopods that is synonymous with the word premium. that goes for the quality and features as well as the price. Best Monopods. It's not just about what other people think and give their opinions on what the best monopod is. It is also about your preferences come into play on deciding what monopod to buy. How to Use a Monopod. Tricks that a lot of photographers don't know on using any, not just a Slik monopod. I didn't know these tips until I started researching monopod reviews. Monopod Tips. Video giving three reasons on why using a monopod makes sense and 4 tips on how to use a monopod the best way. Camera Monopods. There is a big difference between a camera monopod and a walking monopod although sometimes you can use one for the other. In addition to the monopod reviews on Slik monopods and others, please enjoy all of the digital photo tips on this website. Happy Shooting!